This is the year of the bean. My tiny in-town garden has been pumping out bush beans at the rate of 1-2 quarts a week for the past ten weeks from the same two 8-foot rows, and is still going strong. The green one, a variety called Provider, lives up to its name in spades. The yellow one, Gold of Bacau, is among the most delicious fresh beans I’ve ever eaten. And then there are the climbers. 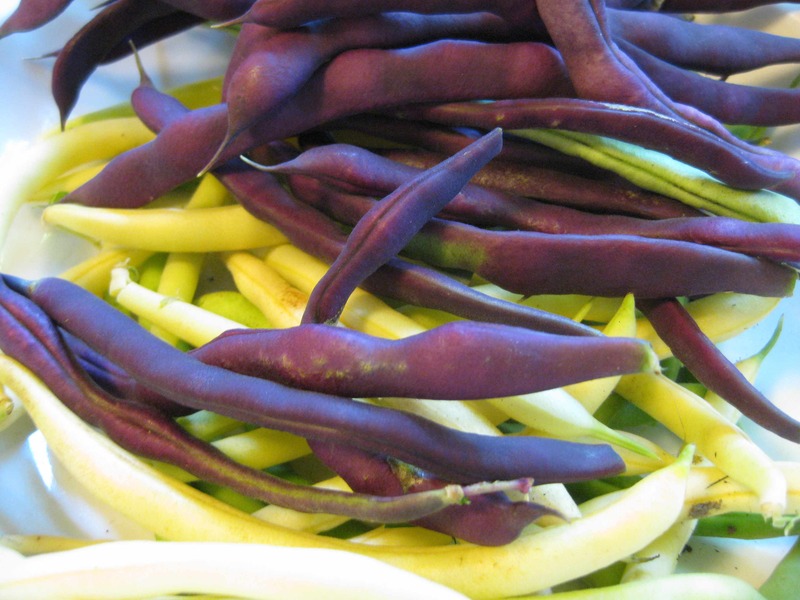 Gran Violetto produces very flavorful Romano-like flat beans that are violet in color when raw and turn a luscious shade of dark green when cooked. I’m growing this type as second crop of bush beans, which I planted in August for harvesting later this month. 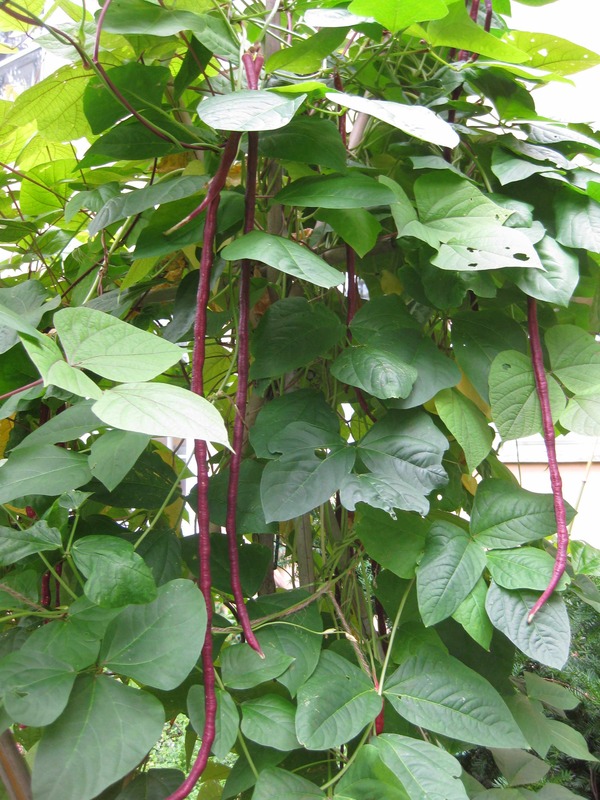 Chinese Red Noodle Yard Long Beans have beautiful violet and cream flowers and very long red pods, a real conversation piece. They are stir-fried when thin and eaten as shell beans when they get large. I’ve seen green ones at the Asian vegetable stall in our local farmers market, but never red. And finally, the showstopper: Purple Hyacinth Beans. 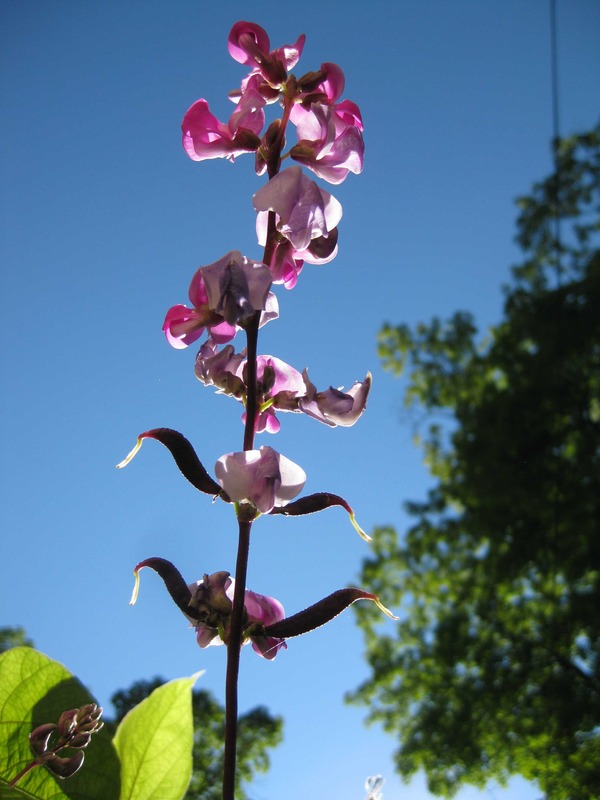 The abundant flowers arrayed around long stalks turn into curving flat beans that need long slow cooking. These beans are already ten feet tall and would be taller if our trellis reached that high. With all this bounty, I’ve been a little apprehensive about the bean harvests at our CSA, and for good reason. In the past two weeks, we’ve been able to pick 10 quarts of green beans. I pick only when we can reasonably consume fresh, since I don’t care to freeze beans in any volume. And there are only so many jars of pickled dilly beans we will use from the pantry. Freezing soup, on the other hand, is a perfect way to preserve the beans. I always have around me a bevy of starving artists and graduate students who are happy to have soup in their apartment freezers. 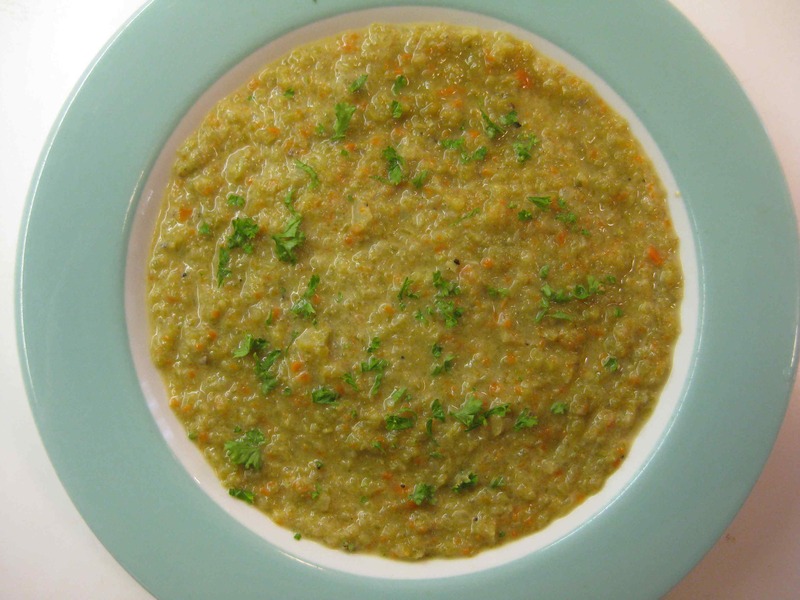 The soup and stew have the same base: green beans cooked with the usual aromatics – onion, garlic, carrot and celery – in a flavorful broth. I used a vegetable stock that had been cooked with a smoked ham hock. For the stew, I added diced potatoes and chunks of smoked German sausage. For the soup that was going to be frozen, I left out the potatoes and sausage (potatoes don’t freeze that well) and pureed the soup. You could also freeze the stew prior to the addition of the potatoes and sausage. Both can be served sprinkled with parsley and accompanied by a dollop of sour cream. Top and tail the green beans and cut them into ¾ to1-inch lengths. Heat the oil in a large saucepan and add the onion, celery, carrot and garlic, cooking them slowly until the onion starts to wilt. Add the green beans and stir to coat them with the oil. Add peppercorns. Add liquid barely to cover the beans and bring it to a boil. Lower the heat to simmer the vegetables until the beans are very tender, about 45 minutes. Add the potatoes, bring the mixture to a boil and lower the heat to simmer until the potatoes are tender, about 15 minutes. Add the vinegar and sausage to the mixture for the last 8-10 minutes to help flavor the liquid. Adjust the seasonings and serve with mined parsley and sour cream, if desired. 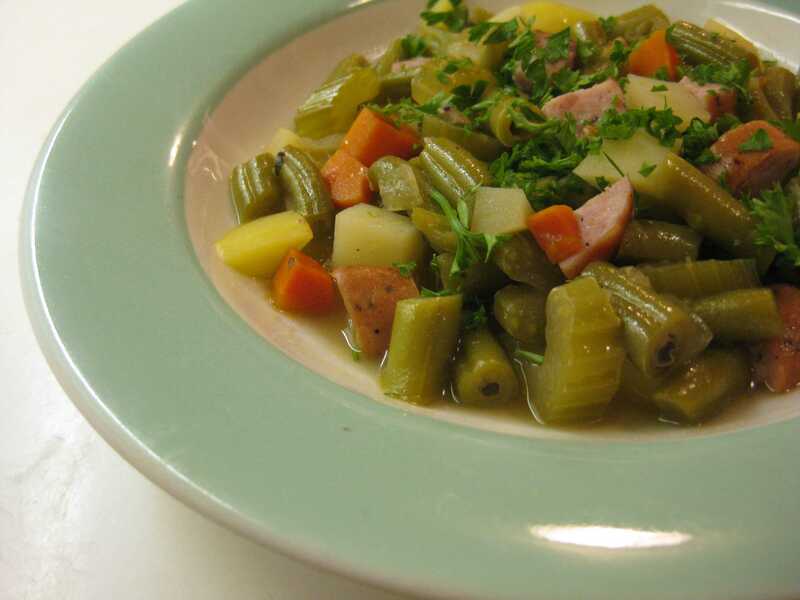 Variation for Soup: Leave out the potatoes and sausages and coarsely puree the bean mixture.